We are finally here to tackle the age-old question of carpet versus vinyl when it comes to pontoon flooring. If you’ve been in the pontoon/boating community for at least 3 years, you might have witnessed the ‘ascend’ as a boat flooring material. Most of the boats made before 2010 have default marine carpet for flooring, but it’s nearly impossible to find newer models without vinyl – which is probably enough evidence that vinyl is better than carpet. I myself have tried both, and I must say that vinyl is better from ANY point of view – from cost and installation to maintenance and feeling. So, what makes vinyl better than carpet when it comes to boat flooring? First and foremost, vinyl doesn’t soak water. This alone should be enough to convince any boat owner to switch. Even marine-grade carpeting soaks water – which is unavoidable when we talk boating. No matter how careful you are when driving or fishing, water is going to end up on the deck – that’s just how it is. Besides that, spilled drinks and food crumbs will easily get into the carpet, trapping unpleasant smells and bacteria. Wet carpeting doesn’t sound that bad until it starts growing mold, and even affecting your wooden deck. And unless you can’t leave your ‘toon out in the sun for a couple days to let the carpeting dry before driving it back into your garage, vinyl is the way to go. Vinyl is non-absorbent – I’m talking both water and smells, so you won’t have to worry about any of those if you opt for it. Speaking of leaving your boat out in the sun – carpet is more likely to get discolorations due to UV exposure. While this isn’t as problematic as mold or bad smells, sunburnt patches on your carpet will make your boat look unkempt – which is probably not something you want. Most vinyl floorings are UV resistant, so you won’t have to worry about that if you switch. Vinyl is much easier to maintain. 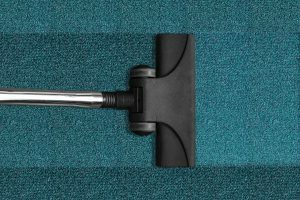 With carpet flooring, you’d have to get special carpet cleaning solution, get a bucket and a brush, and take a whole afternoon to scrub every inch of your deck by hand. Even that might not leave the carpet 100% clean and odor-free. With vinyl, all you need is a bottle of vinyl cleaner solution (universal cleaner works too, and one bottle goes a long way) and a mop, and you’ll be done cleaning the whole deck in minutes! Besides, if you accidentally spilled something on the deck, you can just wipe it away with a cloth and you’re good to go! But vinyl is slippery, cold, and noisy! These are the three most common anti-vinyl myths I’ve heard. However, I disagree with all three of them. Yes, classic vinyl is slippery, especially when water gets on the deck, but you can also opt for textured vinyl, which is a bit more expensive, but also much safer and pleasant to walk on. As for the noisy part, if the squeaking really bothers you, you layer some cushioning material like foam between the vinyl and the deck – but believe me, just give it a bit of time and you won’t even notice the noise. I could on forever about why vinyl is better than carpet for pontoon flooring. In addition to all said above, vinyl is easier to install, replace, and sometimes cheaper than carpet. So if you’re thinking of switching to vinyl, it’s a big thumbs up from me. I honestly have no idea why someone would still want carpeting on their boat, pontoon or not. It’s so hard to keep in good condition that any advantages pale in comparison. Vinyl all the way man! I recently got my hand on a second hand boat (a 2008 model) which still had carpet flooring on. The boat was in good condition overall, but the flooring kind of betrayed its age. I finally splurged and got it replaced with vinyl last week though, made a world of a difference.